Last month, Enviva reached an important milestone. With the publication of the third set of data from our Track & Trace forest supply chain tracking system, 15 months of Enviva’s sourcing data are now available in the Track & Trace section of our website. We hope you’ll explore the Enviva Wood Supply Map to learn more about the 1200+ harvests from which we sourced between October 2016 and March 2017. While you’re on the website you can go back in time too, by viewing the archived summary data on our wood supply, dating back to January 2016. A few highlights from the most recent release: enterprise-wide, about a quarter of our incoming wood (23 percent) came in as sawmill residues, and just under a third of our material (29 percent) was sourced from southern yellow pine forests, primarily as thinnings. The data also show that we continue to source the lowest-grade wood: on average, 31 percent of the wood from a given harvest was delivered to us, with the remaining volume going to other regional forest products markets. These aggregated summary statistics – the ones that pop up first on the website – provide a snapshot of our sourcing. They are helpful as sound bites and communication tools, but they tend to gloss over important regional differences between our sourcing regions. The U.S. South is home to a wide range of forest types and management practices, and the Track & Trace dataset – which summarizes our wood purchasing for all 6 of our mills in the SE US, from Virginia to Florida – underscores this diversity. We do break down the characteristics of the forests from which we source by region on the Wood Supply Map page of the website. We know, for example, that in the Chesapeake region we source wood from more mixed pine-hardwood forests than anywhere else, and we use more sawmill residues in our Southeast region than in our other regions. But there are important reasons for these differences, reflecting the ecological and market realities in the various forests where we operate. As a specific example, information we collect on percent volume to Enviva, or the total proportion of wood from a harvest sent to Enviva versus other forest products consumers, illustrates the ecological reality of the forest products industry in the area surrounding our Cottondale mill in Florida. While Enviva’s other facilities typically receive 20-30 percent of the volume produced from a harvest, at Cottondale on occasion we will receive 50 percent or more of the wood from a tract. The wood we use at Cottondale is no different from the wood that comes through the gate at our other mills: it is still of the same size, quality, and predominantly family-owned forest origin as the wood in the Chesapeake and Wilmington regions. But because we have Track & Trace, we know that this variance in proportion of harvest volume received is due to forest types and management practices which are unique to the forests in the Florida panhandle, and different from our other forests. Specifically, around our Cottondale mill, sand pine and scrub forest ecosystems are more prevalent. Sand pine and scrub forests are frequently found in dry, sandy areas with low-fertility soils. They are characterized by small, crooked sand pine trees and other woody shrubs and trees with an affinity for low-quality sites that have historically been managed for the production of pulpwood. They are typically managed on short rotations, which mimic the historic frequency of fires (every 3-15 years) in these landscapes. As a result, the wood that grows there rarely reaches sawtimber quality. Figure 1. 25 year old sand pine forest. Though these forests cannot produce high-grade forest products, they are valuable because they can be harvested during extremely wet conditions when other stands are not accessible, and because they provide habitat for a variety of unique plant and animal species. In these systems, the disturbance provided by timber harvesting mimics the small lightning and human-caused fires that were frequent prior to European settlement of the South. These fires are often suppressed on today’s more developed landscape, resulting in older age class forests with less biodiversity and an increased risk of dangerous, widespread wildfires. The Forest Service harvests timber on the lands they manage to simulate the fires which historically maintained diversity on these forest landscapes, keeping these forests in the 3 to 15 year age class. 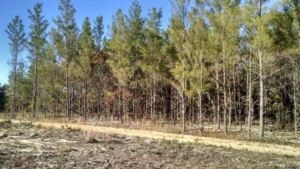 By creating demand for low-grade wood which cannot be used by other forest products consumers, Enviva provides a financial incentive for private landowners in the Cottondale region to harvest these sand pine and scrub forests, which have been accumulating in older age and diameter classes due to a lack of disturbance. In many cases, this type of harvest is the first step to restoration of longleaf pine habitat. So – while Enviva may receive a larger proportion of the volume of wood harvested from these forests, the market we provide for the low-quality wood promotes a more natural disturbance regime and supports efforts to conserve biodiversity in these unique landscapes. As always, we hope you’ll take the time to explore our T&T website as well as send us any feedback or questions you may have. You can reach me at jennifer.jenkins@envivabiomass.com, or on Twitter at @jenkins_jen. We look forward to continuing conversations and this important work with our stakeholders to understand the complexity of our Southern landscape and the management practices we can employ as forest stewards to make sure it remains healthy and thriving. Brown, M.J., Nowak, J.. 2016. Forests of Florida, 2014. Resource Update FS–91. Asheville, NC: U.S. Department of Agriculture Forest Service, Southern Research Station. 4 p.